Combo bouncers are a great choice when you want to get the biggest bang for your rental dollar. 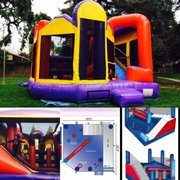 Combo bouncers get their name from being a "combination" of the popular bounce house and additional exciting features like climb & slides, basketball hoops, and obstacles. Browse the selections below and click on the "More Info" link for more details and to make a reservation.